Ford Racing has announced its 2011 RallyCar contingency program to support competitors who campaign Ford entries in three classes of the 2WD division. 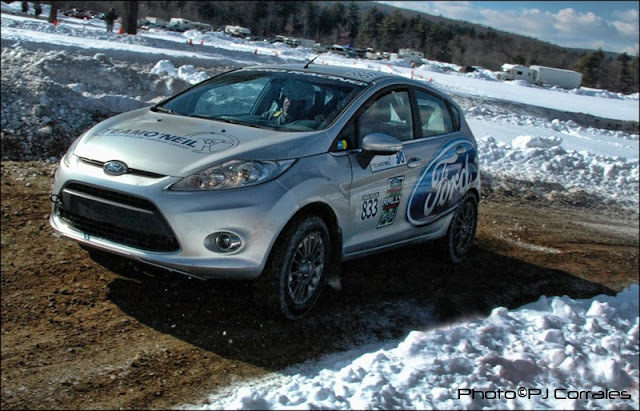 The Ford Racing contingency payouts will be available for all Ford competitors at the RallyCar 2011 Rally America National Championship events as well as for Fiesta entries at RallyCar regional events. Ford Racing contingency program will award competitors competing in the Fiesta Sport Trophy (FST) championship featuring the R2 Fiesta as well as competitors in Group 2 and Group 5. Ford Racing will also award a championship prize of $5,000 to a Ford driver for wining the overall 2WD Rally America National Championship. "Our program in RallyCar has been a big part of establishing the Fiesta brand in the United States," said Scott Denby, Ford Racing Business Manager. "Fiesta offers competitors a great Rally platform which has benefitted from years of development in Europe and we're committed to helping reestablish 2WD rallying in the U.S. with Fiesta. From our involvement in the Team O'Neil Fiesta Rally Experience, to our growing support of RallyCar, their competitors and enthusiasts, we are excited for the future of the sport." "Ford is bringing support and excitement to 2WD rally that RallyCar has been missing," said J.B. Niday, RallyCar Managing Director. "The Ford Fiesta Sport Trophy should develop into an exciting series and their contingency program support for any Ford demonstrates their broad commitment to rally racing." Ford North America Motorsports, based in Dearborn, Mich., is responsible for major racing operations in North America, including NASCAR (Sprint Cup, Nationwide Series, Camping World Trucks), Grand American sports car racing, NHRA drag racing, RallyCar and USAC midget car racing. The department also oversees the development and marketing of Ford Racing Engines and Performance Parts, the outreach programs with all Ford Clubs and Ford enthusiasts, and the marketing of the Ford Racing brand. For more information regarding Ford Racing's activities, please visit http://www.fordracing.com/. Based in Golden Valley, Minn., RallyCar sanctions the premier performance rally series in the United States, the Rally America National Championship Series. In 2011, RallyCar is conducting six National Championship events at venues across the country, from Olympia, Washington to Newry, Maine. RallyCar competitors reach speeds of well over 100 mph in modified street cars on natural-terrain courses consisting of gravel, dirt or snow. Additionally, RallyCar sanctions the 2011 U.S. Rallycross Championship featuring rally cars racing door-to-door on tricky tarmac/dirt race tracks. More information about rally and rallycross can be found at www.rally-america.com, and videos can viewed at www.youtube.com/rallyamericaseries.